"We'll like to order a full custom figurine. 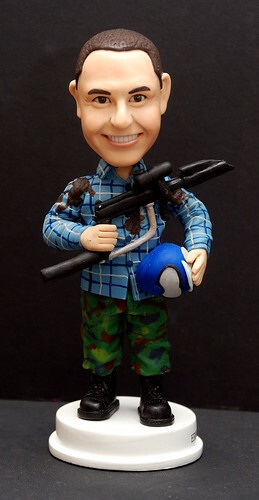 We want to make a figurine of our boss, David, in his Paintball attire. Pic 1-4 show him in his paintball attire. Pic 5-6 are close-ups of his face. Pic 7-8 are close-ups of the weapon he used during paintball. This order is different from the usual order. The latter is customised the head only, according to the photos of the face provided by client. The body and settings\ are ready made. New mould needs to be created for the body. This means the time to do it is longer. Comic illustration - Don't catch the bottom! Comic illustration - Don't Panic! Comic illustration - Buy on breakout? !